It really is great to see what students from Coláiste Lurgan, in Galway come up with. They have done many covers in Irish over the years but this is our personal favourite. In fact, this video is fast approaching 1 million views! Well done guys! It is great to see how they are promoting the Irish language in a new and modern way. Be sure to Pin this lovely image to your Pinterest boards. We also loved their cover of “Cheerleader” by OMI, which has racked up 1.5 million views already!! mbogann mé do chroi dhuit? So great to hear wonderful music in the native language and being enjoyed and sang by Irish children. Love it when you have the words in Irish .It helps to learn the language. Beautifully done . Amazing and makes so proud to say I have Irish blood running through my veins…. I’m not happy with my reaction…I’m a bit angry…actually…I’m angry my ancestors native tongue was being stripped from them by Brit Colonization long before they started their retreat to the new world…from famine, or strife. I’d love to know One word, other than our Flags motto and the toast….I’d love just to know how one pronounces a word beginning with “mbh”and followed by an equally random string of vowels.. it has just become so foreign to a 3rd generation “mic’ here… this deeply saddens me.. I listen to the Lurgan songs a lot all the ones I have heard are better than the originals very talented. Loved the kids and their voices.They were amazing.I was born in England of Irish speaking parents.I can speak it fluently and read it fairly well.So glad my grandkids are learning it from me too.WE need to keep our native language alive for generation’s to come. is the Gaelic for hello, hello? 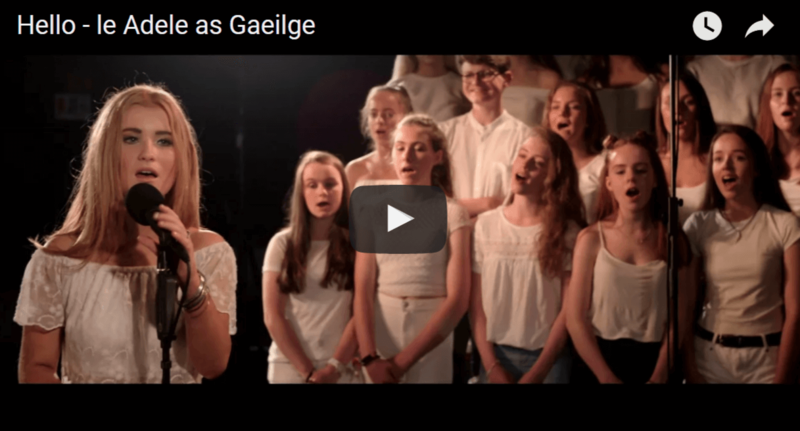 Beautiful, a fantastic song for Laois People Worldwide to hear.